KIEV, Ukraine -- Ukraine's president has told the BBC his country is now in a "real war" with Russia - and that Ukrainians should prepare for a Russian offensive. Russia denies it is supplying arms and personnel to separatist rebels in eastern Ukraine. President Petro Poroshenko told the BBC's Fergal Keane he did not trust his Russian counterpart, Vladimir Putin. However he said he had no option but to negotiate with Putin. Russia denies Western accusations that it has sent regular troops and armour to help the rebels in eastern Ukraine. The United Nations says at least 6,200 people have been killed since fighting started in eastern Ukraine in April 2014. Pro-Russian rebels made significant gains in the region, including, most recently, the rail hub of Debaltseve. They, and Russia, have denied they are receiving Moscow's support. But Russia's role has again come into question, after the capture on Saturday of two men Ukraine said were elite Russian soldiers working in eastern Ukraine. In a video, the men confirmed they were active Russian servicemen, but Moscow said they were no longer employed by the state when they were caught. Mr Poroshenko said: "Can I be absolutely clear with you this is not a fight with Russian-backed separatists, this is a real war with Russia. When asked whether he feared a summer offensive by Russia, Mr Poroshenko said: "I fear anything. I believe they are preparing an offensive and I think we should be ready and I think that we do not give them any tiny chance for provocation. That will totally be their responsibility." Mr Poroshenko added that, despite not trusting Putin, he had no option but to have faith in diplomacy. He said he feared parts of eastern Ukraine could not be taken away from rebels by military means alone - meaning diplomacy was the only answer. On Tuesday, NATO's Secretary General Jens Stoltenberg called for an end to snap exercises by Russia close to the Ukrainian border, and demanded Russia be "more transparent when it comes to their military activities". A ceasefire agreement was signed in Minsk in February, but heavy fighting has continued since then. Last week, Mr Poroshenko said at least 83 Ukrainian servicemen had been killed since the ceasefire came into effect. Elsewhere in Ukraine, at least four Ukrainian soldiers were killed in the eastern Luhansk region on Tuesday. 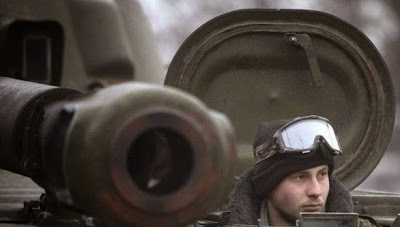 The region's governor said the men were attacked by separatist rebels near the village of Katerinovka. It is very interesting situation, if Mr Poroshenko can see and believe that Ukraine fighting real war with Russia, it would be a good time to declare martial law and declare war against Russia. It just make sense to do so. It will not change Russian behavior because Ukraine is not attacking any Russian territories it is on defensive. It will give Russian no choice but become involved and will not be able to deny any longer its participation. «Мы даем доступ к этим солдат всем гуманитарным организациям. К ним уже приходили представители ОБСЕ и Красного креста. Какие еще доказательства мы должны предоставить миру? Хотя мир нам и так доверяет. Какие еще доказательства мы должны предоставить России, что это их солдаты, их регулярные силы и их война и агрессия?», - спросил Порошенко. "Yesterday I walked through the swamp and got raped, Today I walked again through the swamp and being raped again, I bet Tomorrow I will be raped again when I go to the swamp." Please Mr.Poroshenko do not sound like that frog.